Morisia monanthos - Cruciferae. (The name is commemorative of professor Moris of Turin). A monotypic genus that comes from Corsica and Sardinia where it grows in sandy conditions at sea level. 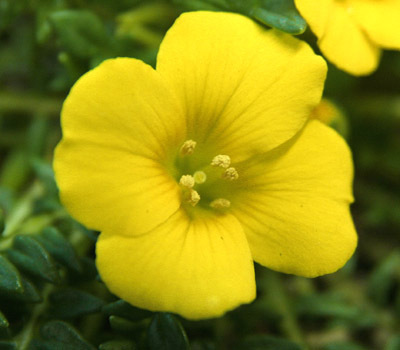 It has attractive, dark, glossy-green saw-toothed leaves and bright yellow flowers, which appear from March-July. Suited to a trough, scree, or raised bed in full sun, in a well drained, sandy, but not too rich a soil. 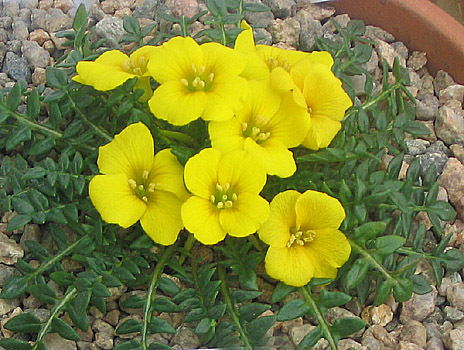 Morisia has a long tap-root, and is not a long lived plant in cultivation, and is best increased by root cuttings. My specimen is overwintered in a cool greenhouse and moved to an alpine frame for the summer to minimise soaking from the Limavady rain. To date it has not set seed.